No standard production at Viem We do not carry anything "pre-packaged"; the furniture is made after measuring the rooms to be furnished and after defining the personality of your kitchen. Unbound to standard modules, our designs are free of the limitations that can prejudice the aesthetics of the elements. If a kitchen is 146 cm in length, a "standard production" would use modules of 90+50+a 6 cm band, while we would make three equal modules of 48.67 cm, with an aesthetically better result and without additional costs for having a "non-standard" size. 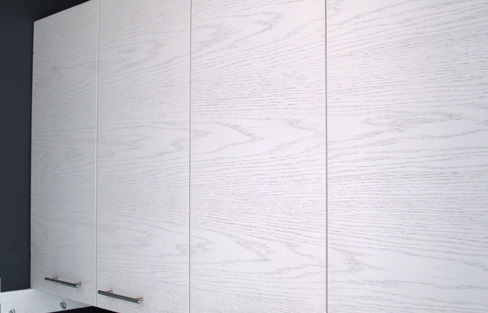 When we make a kitchen or wooden furniture, the grain is not different from door to door, instead it flows evenly on all of the façade and even visible sides always have the same finishing as the doors. Viem materials are always of first quality, as are the internal structure (carriages, chest drawers, etc.) and, not to be neglected, also the hardware is in line with the same quality standard. Our work cycle starts with the interview with the customer to understand their logistical and aesthetic needs; then the materials are selected, the electrical appliances, the countertops, followed by our floor plans, complete with designs, renderings and relative estimate. For those restructuring their house, we can also provide designs of the electrical and hydraulic systems to be done. Afterwards measurements are taken of the rooms and then the actual construction of the kitchen (or the furniture) is done. Lastly, during the installation phase, a staff of specialised carpenters will install it using our survey, because furniture must be built accurately, but also installed precisely, regardless of irregularities in your house or structural elements that can require more on-site modifications. This path leads us to the unique and unrepeatable achievements which have always made our brand stand out.